By any name–knitting for others, knit it forward, service projects, charity knitting, gifts for humanity—our Guild cares by knitting. Knitting at a Philanthropy Event! Knit hats, scarves, shawls, mittens, slippers–just about anything is welcome. 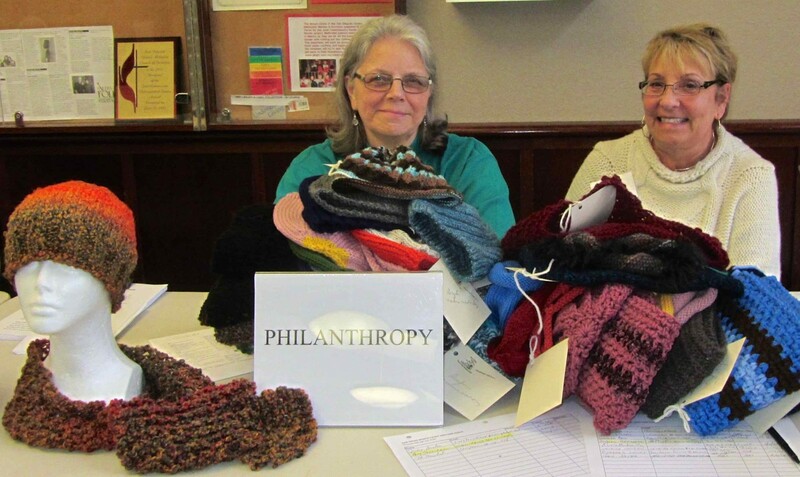 Bring knitted donations to any monthly Guild meeting. Add a Philanthropy Hang Tag to your project to include a message to the recipient, to list fiber content, to note laundering instructions or just to say hello. 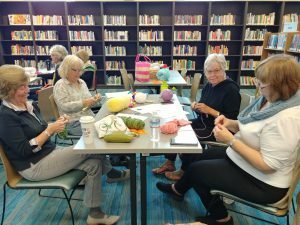 Attend a Share A Knit Philanthropy Event. Contact Philanthropy Coordinator Ginny Newton to see how you can help. Do you wonder who receives the scarf or hat you’ve made? Read this. Women’s Resource Center in Oceanside helps families rebuild their lives after crimes of domestic violence. The center provides important items like medications, household necessities, toiletries, toys, etc., and is very happy to accept the Guild’s donations of knitted or crocheted items such as scarves, hats, clothing, and blankets. See their website for more information. Davita Dialysis Centers throughout San Diego county provide dialysis services to adult patients who suffer greatly from cold and shiver while undergoing dialysis treatment, either at the centers or at home, several times a week. The patients sincerely appreciate our gifts of hats and scarves. Handmade Especially for You distributes comfort scarves to shelters for abused women throughout Southern California. Knit any scarf pattern of your choice. Red scarves four to five inches wide and 50 to 60 inches long will go to HeartScarves for women heart patients. Project Linus provides blankets for children of all ages. 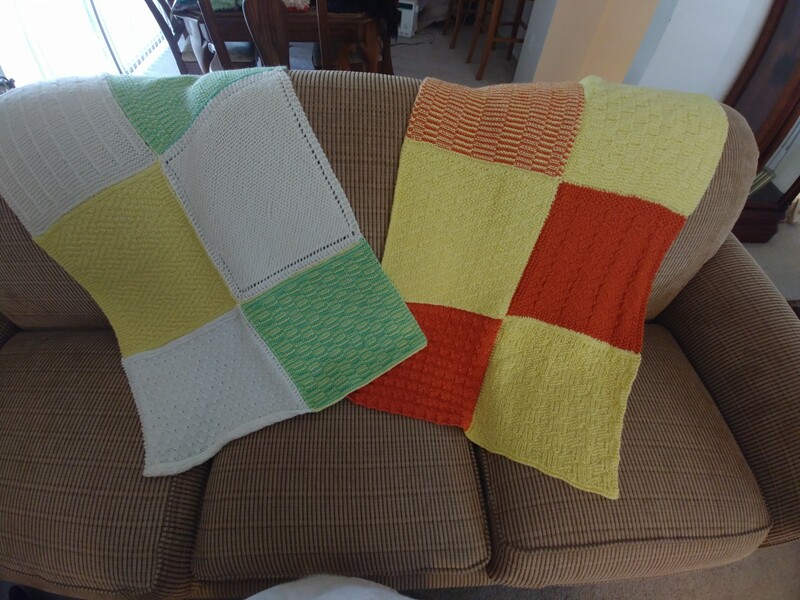 Blankets should be hand-made (with love) and knitted or crocheted of new, washable materials in child-friendly colors and come from a smoke and chemical-free environment. Please knit an crochet in tightly-held patterns so children will be less able to poke their fingers through the holes. Remember they need boy-types as well as girlie ones – they seem to receive more pink than blue. 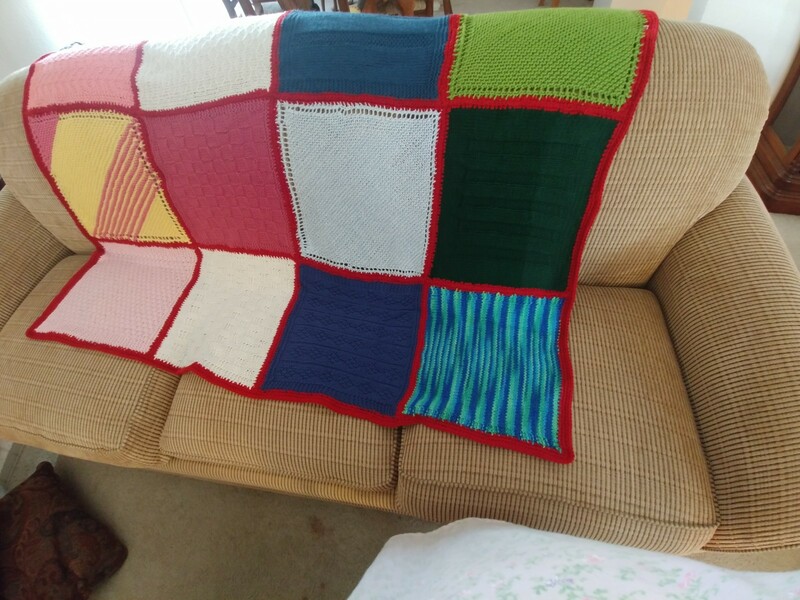 As a whole blanket (minimum measurement of 36” x 36”) is a huge endeavor, knit and donate just one or more 12” squares, and we will make sure the squares are seamed together and the completed blankets donated. Two blankets knit and assembled by Guild members and ready for donation are shown. Bundles For Babies This group, operated through Temple Solel, provides items for teen moms in need of supplies for their newborns, as well as staging baby showers for military moms. They would love any and all knitted or crocheted baby items you care to make and donate. The Emilio Nares Foundation was started by the parents of Emilio Nares after his heartbreaking illness and death. The most requested items are hats for teens and headbands fitting kids 6-21 years young. Please keep the hats soft and knit them to cover the entire head. Blankets are needed too, but any and all items will be happily accepted. You can contact the Emilio Nares Foundation directly at info@enfhope.org. Rachel’s Women’s Center in downtown San Diego is a drop-in day center for homeless and very low income women. Its mission is to provide a safe, supportive, sober environment and opportunities for women with few or no resources to gather, begin, and continue self-help efforts. There is also an emergency night shelter which accommodates 35 women and their children for short term assistance. They accept all donations of women’s and children’s clothing and accessories, which includes all knitted items, of course. Rachel’s Women’s Center is open 7 days a week from 7am-6pm. Please visit their website for more information Homeless Women’s Services. Becky’s House, YWCA, is one of the largest providers of domestic violence services in San Diego County, and one of the only resources for male victims. Additionally, their emergency shelter is the only facility in the region that accepts clients at all hours of the day and night. Becky’s House fulfills the complex and often life-threatening needs facing survivors in the community. Their gender-inclusive domestic violence programs encompass a 24-hour crisis hotline, emergency shelter, transitional housing, legal support, and supportive family services. This specialized system of care allows clients to recover from trauma, develop individualized plans to advance their life goals, obtain permanent housing, and achieve lasting self-reliance. Learn more about Becky’s House programs at Becky’s House. Softies make a difference in the lives of women dealing with breast cancer. Softies are hand-knitted breast prostheses. We donate Softies to these San Diego county cancer centers: UC San Diego Health – Moores Cancer Center: Comprehensive Breast Health Center, Scripps Polster Breast Care Center, located on the campus of Scripps Memorial Hospital La Jolla, Scripps Green Cancer Center, located on N Torrey Pines Rd in La Jolla. Our Softie pattern is free here on the Guild website’s new Softie page and on Ravelry. Rachel’s Women’s Center in downtown San Diego is a drop-in day center for homeless and very low income women. Its mission is to provide a safe, supportive, sober environment and opportunities for women with few or no resources to gather, begin, and continue self-help efforts. There is also an emergency night shelter which accommodates 35 women and their children for short term assistance. They accept all donations of women’s and children’s clothing and accessories, which includes all knitted items, of course. You can learn more about Rachel’s programs at Homeless Women’s Services. The Emilio Nares Foundation was started by the parents of Emilio Nares after his heartbreaking illness and death. We will knit hats for the many children in San Diego undergoing chemotherapy treatments. Please keep the hats soft and knit them to cover the entire head. Handmade Especially For You distributes “comfort” scarves to shelters for abused women. Knitted and crocheted scarves are donated to more than 60 shelters in California including Becky’s House and Rachel’s Shelter, both in San Diego, and the Women’s Resource Center in Oceanside. Knit any scarf pattern or try one of these: Scarf Made From Two Different Yarns or Horizontal Scrap Scarf On Circular Needles or Diagonal Comfort Scarf. Learn more at handmadeespecially.org. Oz San Diego serves teens who are experiencing school and family difficulties, and those who have run away from abusive homes and are homeless. Located in Oceanside, Oz focuses on youth strengths, and the development of coping, communication and life skills. Donated knitted hats and scarves become treasured gifts for some of the 350 to 500 homeless teens in San Diego County. Learn more at Oz Shelter. Of course, you may continue to knit for any organization. Just contact the group directly –click on the Learn more link in the descriptions below to see how you can help. Tête-à-Tête Hats distributes hats nationwide to chemotherapy patients, hospitalized infants and children, and others in need of head coverings. Knitted hats, caps, cloches, tams, beanies and berets in all sizes for girls, boys, women and men are welcome. Learn more at Têtê-à-Tête Hats. Operation Gratitude sends care packages to U.S. service members deployed overseas to lift their spirits. Knitted hats and scarves for men and women are included in every package. Learn more at Operation Gratitude. Read the heart-warming message from one recipient of a knitted donation from the Guild here. 2015 Philanthropy Chair Arlene Shaposhnick (left) and Jeanette Ollivier (right) collecting knitted donations at a Guild meeting. An unnamed guest models a colorful hat and soft scarf.